Not to be confused with Type 071 icebreaker. Displacement: 25,000 tons full load. 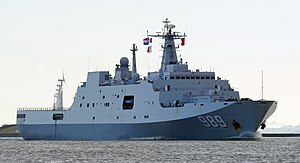 The Type 071 (NATO reporting name: Yuzhao) is a Chinese People's Liberation Army Navy (PLAN) amphibious transport dock. The Type 071 provides the PLAN with capabilities and flexibility not found in its previous landing ships. Type 071 LPD ships feature a unique hull platform offering a large dock space. The ship also offers a dedicated space for medical care and is equipped with a fresh water supply system. The stabilizers fitted to the vessel reduce roll and improve the stability in high sea states. The amphibious warfare ship features a vehicle deck, well-deck, landing deck and a hangar. It can carry a combination of marines, vehicles, landing craft and helicopters. The ship may embark 600 to 800 troops. The stern helicopter deck offers two landing spots for supporting the operations of two Z-8 (SA 321 Super Frelon) transport helicopters. The twin-door cantilever hangar can house up to four Z-8 helicopters. The well deck houses up to four Type 726 air-cushioned landing craft., which can transfer vehicles or marines to the shore at high speed. The LCAC are launched by flooding of the docking area. The vessel can also carry landing craft on port / starboard davits. The vehicle deck can house amphibious assault vehicles including ZBD05 amphibious IFV, and ZTD-05 amphibious light tank. The stern ramp, two side doors and ramps allow rapid loading of the vehicles and equipment. The ship is armed with one 76 mm gun and four 30 mm close-in weapon systems. The Type 071 may operate as the flagship of a task force. the Type 071 may also conduct and support humanitarian, disaster relief, and counterpiracy missions, in addition to amphibious assaults. The LPD is equipped with a Type 360 (Seagull-S) air / surface search radar operating on E / F-band frequencies, a Type 364 G-band air search radar, a Type 344 I-band fire control radar and a navigation radar. The Type 071 LPDs are powered by integrated combined diesel and diesel (CODAD) propulsion, controlled by an automated propulsion control system. The propulsion system integrates four Shaanxi 16 PC2.6 V400 diesel engines driving two controllable pitch propellers through twin shafts. Each engine produces a maximum power of 35,197 kW. The power-plant provides a maximum speed of 25kt and a range of 10,000nmi at 18kt. The maximum endurance of the vessel is 60 days. The China State Shipbuilding and Trading Corp. consortium offered to build a modified Type 071 for the Royal Malaysian Navy. The Malaysians had a requirement for a 13,000-ton LPD; the Type 071 would cost a third of the similar US-built San Antonio-class LPD. ^ a b c d e f g h i j k l Tate, Andrew (16 June 2017). "China launches fifth LPD for PLAN". IHS Jane's 360. Archived from the original on 18 June 2017. Retrieved 18 June 2017. ^ a b Rahmat, Ridzwan (22 January 2018). "China launches sixth Type 071 LPD". Jane's 360. Archived from the original on 18 November 2018. Retrieved 17 November 2018. ^ a b "China's Fifth Type 071 LPD 'Longhushan' Commissioned with the PLAN". Navy Recognition. ^ a b c d e f "沪东中华：为中国海军打造"靓丽名片"". cssc.net.cn. China State Shipbuilding Corporation. 28 August 2014. Retrieved 18 June 2017. ^ United States Office of the Secretary of Defense (2017). Annual Report To Congress: Military and Security Developments Involving the People’s Republic of China 2017 (PDF) (Report). pp. 25–26. Retrieved 18 June 2017. ^ a b United States Navy Office of Naval Intelligence (2015). The PLA Navy: New Capabilities and Missions for the 21st Century (PDF) (Report). p. 17. Archived from the original (PDF) on 18 May 2015. Retrieved 6 June 2015. ^ a b c "Type 071 Landing Platform Dock". globalsecurity.com. 11 June 2011. Retrieved 1 July 2011. ^ a b c d e f g h i j United States Navy Office of Naval Intelligence (2018). PLA Navy Identification Guide (Report). Retrieved 18 November 2018. ^ a b c d O'Rourke, Ronald (21 May 2018). China Naval Modernization: Implications for U.S. Navy Capabilities—Background and Issues for Congress (PDF) (Report). Congressional Research Service. p. 44. RL33153. Retrieved 6 July 2018. ^ "China launches seventh Type 071 LPD". Jane's 360.